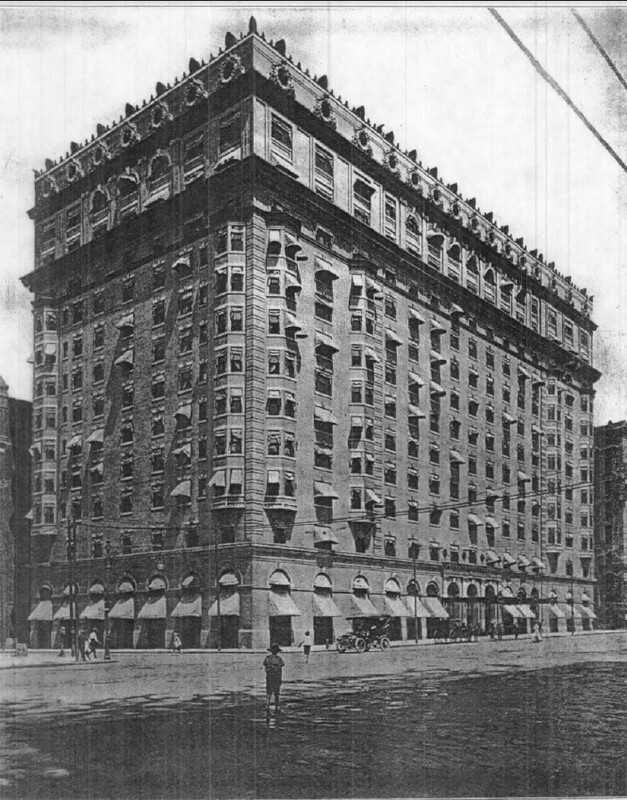 The Hotel Jefferson as it appeared in a 1912 issue of The Mirror. The relocation of St. Louis University’s School of Law into a transformed building at Tucker and Pine streets has helped Tucker Boulevard regain some its lost title to being downtown’s most important north-south street. Students and faculty circulate around what was once one of the city’s most tragic and downright ugly modernist boxes, giving Tucker Boulevard hopeful human energy. New cafes and restaurants suggest that the law school could have a catalyst impact. Should the footsteps of the repopulated species of the Tucker pedestrian march toward Washington Avenue, they will pass by one of the street’s proudest achievements, the neoclassical mass of the Hotel Jefferson. Located between Locust and St. Charles streets, the old hotel is punctuated by climbing bay-window appendages and up-top truncated floral ornament that once cradled rounded windows. 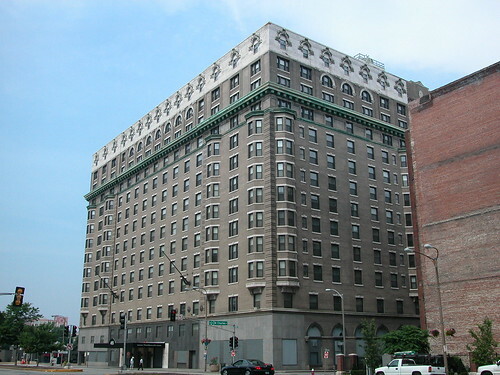 The Hotel Jefferson proclaims an architectural imperiousness befitting its origin as a hotel built for the visitors to the Louisiana Purchase Exposition in 1904. In 1928, ahead of the Depression, the hotel developers built a major addition to the hotel designed by Teich & Sullivan of Chicago. Teich & Sullivan redesigned the lobby of the original Barnett, Haynes & Barnett-designed building, creating an overlook to the first floor lobby encircled by balustrade. The mezzanine level became the home of two new major public spaces in the new addition. The Hotel Jefferson today, better known by its last name, The Jefferson Arms. 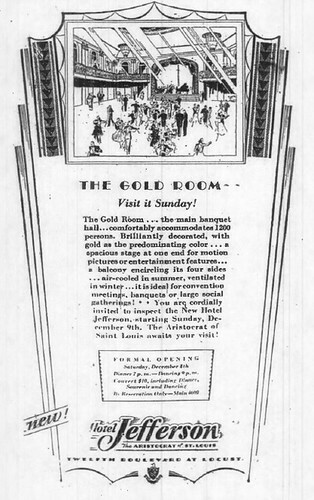 A 1928 Globe-Democrat advertisement for the Gold Room at the Hotel Jefferson. The old hotel’s biggest secret is the Gold Room, whose floor has rested from dancers’ feet for decades. The Gold Room is one of the vestiges of the Jefferson’s late Jazz Age remodel. Today, the lobby sports just a few traces of its 1928 look, including white marble staircases hiding out in the dark, unlit interior. The overlook was covered over after the 1950s, when the hotel briefly operated as a Sheraton. The public spaces read as cross between the would-be mid-century urban streamline and 1980s economical apartment styles. The marble stairs lead to the mezzanine level, where the grandest space in the Jefferson can be found, untouched by all of the modern changes that robbed the interior of complex beauty. 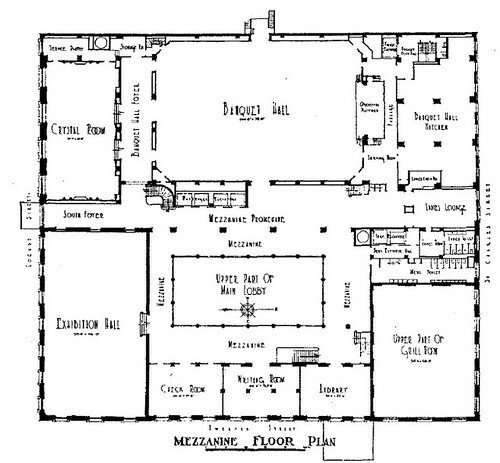 The Gold Room is labeled “Banquet Hall” on this 1928 floor plan that appeared in Hotel Monthly in September 1929. One of the entrances to the Gold Room on the mezzanine level. The Gold Room is a gently baroque artifact, with paneled and mirrored plaster walls, gold-painted accents, undulating balconies, and a ponderous crystal chandelier. Corinthian pilasters set against the walls provide a note of classicism to the space, but not one overtly staid. This room is a room set for fantastic happenings, not business luncheons. The Gold Room is also large: underneath its two-story ceiling, the room could accommodate as many as 1200 people, according to hotel brochures. 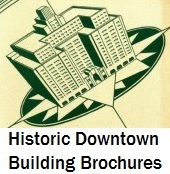 Although the 1928 floor plan for the hotel has it labeled as a “Banquet Hall,” and it hosted many large dinners, the original design anticipated its use for dances — and the floor is a dance floor. Does a swan song for the good old days play in the Gold Room today? The Gold Room floor has attained a layer of broken plaster bits, and piles of discards. For almost four decades, the Gold Room served thousands of people through many large and lavish events. Debutantes came out annually at the Veiled Prophet Dinner in the Gold Room into the 1950s. 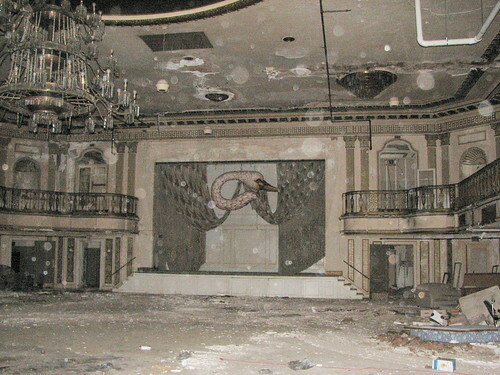 Eventually, however, the Gold Room was shuttered to wait for a new era’s users. Planned renovation of the Hotel Jefferson by the Pyramid Companies — one of the building’s recent mysteries — came and went. The Gold Room will have to await new plans to return to its formerly busy social schedule. Meanwhile, inside of the dim interior of the Jefferson, the golden splendor of the hotel ballroom looks barely different than it did when the the city’s elite were celebrating the admiring gaze of the entire world. When will we next dance in the Gold Room? This entry was posted in Abandonment, Downtown. Bookmark the permalink. wow… beautiful. why can’t we have nice things like this anymore? Everyone does gut renovations today. The room will get gutted, the debris trucked to a landfill, and the space turned into a shiny glass and plastic Starbucks, probably with taxpayer subsidies. We can’t have nice things like this anymore because we don’t deserve nice things like this anymore. Please Please Please someone restore this! It could at the very least serve as a wedding banquet hall. This ball room was opened in 1998 I worked there when it was still for seniors, we had opened it for First Night New Years Eve night that was the last time it was used and we opened it up for the public. When the seniors lived there they enjoyed that place and I loved working there but greedy people wanted to kick the old people out and make it into apartments for everyone and then they didn’t have enough tenants it’s a shame. My brother lived there when it was a senior complex. I loved that building. My plan was to live there, when I retired. Unfortunately, the money hungry idiots moved the seniors out, and it has been sitting empty every since. I still moved out of the suburbs, to downtown, but I really wish I could have moved to the Jefferson Arms. What a waste, to have that beautiful building sitting empty. I’m an now searching for a panoramic photo of the Gold Ball Room which depicted a gala dinner for the Ancient Order of Hibernians. My father and uncle Andy were longtime members, and the AOH had its national convention at the Jefferson in the very early 1960’s. The picture is incredibly clear and about two feet long. Wouldnt it be lovely if someone actually restored this gorgeous building and room to its former glory!!! How exquisite it would be!! Soo sad to see something so beautiful with soo much wonderful history just boarded up n kept from the world as it crumbles… When there’s soo much potential still left for it!!! I say keep all original interior, what’s broken try n replace, n open it back up just as it appeared all those years ago!!! We waste money on so much unnecessary bs, why not use it productively on something like this with soo much meaning n bring a lil more pride back to the city!!! Please restore this place to its beautiful former glory. and rename it the Piasa Room (I know that’s a swan on the curtain, but there’s a similarity, it IS our regional variation on the Phoenix myth after all and it’d probably have to be re-woven anyway). I wonder if the market for that size venue is nearing current saturation to support a full-time music venue. Not likely — places with economic value don’t get torn down in a free market economy. Very interesting post, I was not aware of that building, but it looks beautiful. Wow, this is exciting!!! My mother used to be a dancer for the Virginia Asher Girls at the Hotel Jefferson in the mid to late 1940’s. She met my dad there when he was on leave from the Coast Guard. She still has her silver tap shoes!! 😉 I would love to see this wonderful historic hotel renovated to its former beauty! The reason this won’t be restored like this is because of all the myriad code regulations that strangle renovation. Not that I want handicapped people to be stymied but the regulations are so burdensome with regard to stairways, entrances, bathrooms, lighting, surfaces, etc… that investors give up and demolish. Plus there is the money to be spent in lead paint abatement and all kinds of other chemicals claimed to kill people and those simply become a nightmare to remedy. This is why no one knocks down old factories- too expensive to haul everything away these days. They are our “ruins”. Some century, tourists will hold guide books while walking by them. I remember your wedding reception on a Saturday night in 2006. It was beautiful and everyone were dressed so nice. The Jefferson is a classical European style intact solid concrete building that was once the most spangled hotel in Saint Louis like 50 to 100 years ago when it hosted US presidential visits and such. While was attending UMSL, I lived in a studio apartment for $400 a month including utilities from 2002 to early January 2007 when Pyramid closed the building. Barry Cohen, the owner at the time, opened it up in 2002 to everyone as practical affordable housing which was pretty cool. The rooms were so sound proof and it just felt so safe and comfortable. Most of the residents were super friendly or just stayed to themselves and problems were extremely rare. It was really nice to live without a need for a car with the Metro nearby and the layout being pedestrian friendly though we needed a grocery store and stuff downtown at the time which was strange that a city of 330,000 people didn’t have a store in the center though it does have a pricey food store now. There is a noticable lack of affordable rooms and apartments within reach of the Metrolink similiar to New York and San Francisco that also once had stacks of good affordable compact places. The Jefferson Arms closing was one of thousands similiar situations across the country that created an affordable housing crisis. Such practical SRO housing and other affordable rentals aren’t available any where in the country today due to developers turning into expensive lofts, condos, or shut down, or destroyed. It all needs to be put back for the people by the people. It’s a solid classical building designed to stand for a few centuries like those in Europe and still has no known structural problems. Not only is it historical, it made a great rooming house offering 940 affordable units for singles and couples. Something like this just needs to be cleaned and maintained, but real estate developers and beauracrats of the 2000’s boondoggled it to being a dysfunctional boarded up mess like many other buildings that could and should still be in use. My great aunt, Ellanor Meyerott Douglas was the Chief Switchboard Operator at the very bust Jefferson Hotel. The girls used to listen in on the conversations of mob down from Chicago when the heat was on up there. She had lots of friends in the St. Louis Police Department! i had the pleasure and honor of being in this building as a child. perhaps being ignored for all these years has been a blessing… a silver lining of sorts – waiting for people with hearts in the right place, appropriate respect and veneration for those things from the past that enhance our present. may this sleeping beauty awaken to the splendor she deserves. I wish I had money to buy this entire building I walk by it every day and think of the shame that it is empty. If companies cannot do anything with it then it needs to be sold to someone who will but St. Louis politics you have to know someone or pay someone for the privilege of restoring something. I’d love to make it home for many people something like the Coronado except better management and a better restoration job. Wish I have a couple 100 million but no one would ever finance a student. My mother lived here for the longest time till they closed it down. Before they closed it down my husband worked as maintenance worker so I got to go inside the Gold Room on more than several occasions. When I was there I saw the “party” remnants of what looked like a gala extravaganza (party), I only now noticed that the Swan Float (built for two to sit in) that sat in the middle of the floor matches the stage curtain swan, which I don’t remember this for some reason. I tried to take photos of this room the day we moved my mother out of the Jefferson arms but my camera’s battery got drained for some “odd” reason. 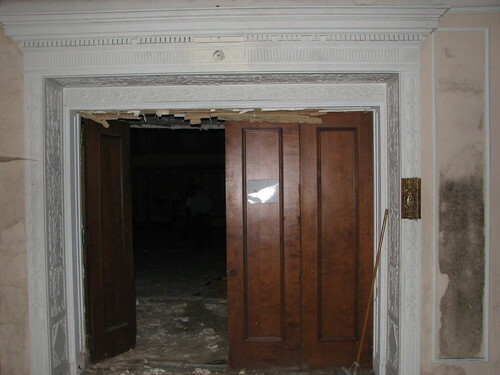 I noticed how many Orbs are in these photos, many will say no doubt from the crumbling debri (was not crumbling like this when I saw it) caused the orbs in these photos but I’ll tell ya, I sure got an “eerie” feeling in that room, also when I’d’ walk down the halls. My mother told me she would see black shadows in the hallway when she took the trash out. Once she said she felt a coldness kiss her lips while she was sleeping! Creepy! My husband said when he was working as a maintenance man had to go to the steam boilers (it was operated by these) so he had to go to the basement where he found a door to a sub-basement that reached to the middle of the street. He said it was really creepy. 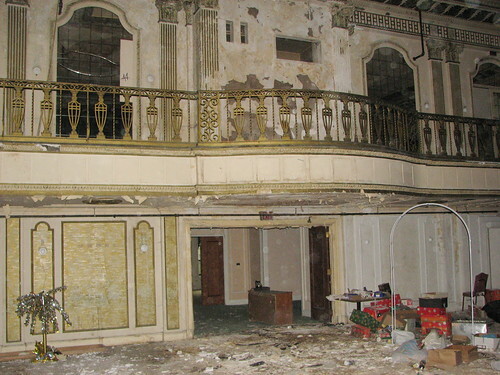 I have no doubt the hotel has plenty of spirits, having such a history of so many people coming in and out, but I hope someone renovates this amazing building! I used to look up at this building on a daily basis from the bank I worked at. I always loved the Romanesque revival style architecture of the building and wondered what the inside was like. I hope the former hotel gets restored to its former glory. Thanks for sharing! You fail to credit Kiel Opera House with catalyzing the long-blocked recovery of St Louis’ dead civic center. Without the opera house there’s is no Blues Hockey team, it is unlikely SLU sends its law school downtown and highly unlikely the Taylors would have restored Soldiers Memorial. Thank Kiel Ooera House for the 12th Street comeback. 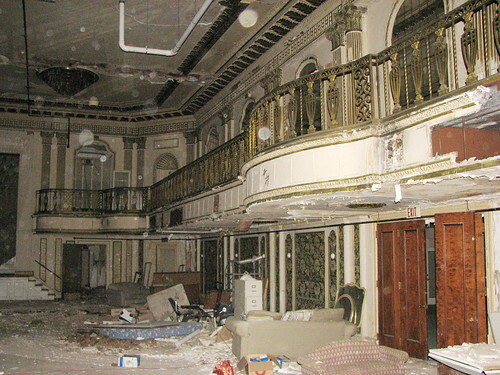 The Jefferson was the Kiel Opera House Hotel. In 1917 it was headquarters hotel for the World Ad Clubs Convention. The buikdingcand opening of the Muny stunned these visitors.